There are many reasons couples prevail in competition for a property and as I have mentioned before on an earlier blogpost, it is not always the highest priced offer. Sometimes, a letter, well written which tells the story of a couple and their love for each other and for the home they wish to make theirs, can make the difference. The happy couple smiling from the front porch of their Corona Heights cottage which they just closed on this past Friday, wrote one of the best letters I have ever read which I included with their offer. 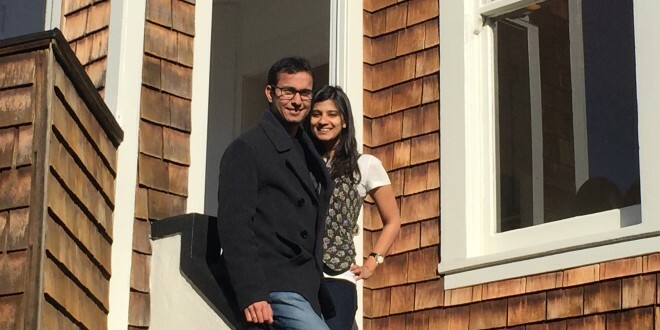 It told of their move to San Francisco from India through independent paths and how “the magic of this city brought us together.” Their enthusiasm for the cottage came through when they described how they “loved that no matter where you stand, you can see the outdoors through a window.” And their dream of sipping tea in the morning on the back porch demonstrated their excitement for possible ownership. I think the icing on the cake was their photo on a tandem bike happily riding though Portland. Their love for each other and for the possibility of living in this home was obvious. What a lucky couple they are to have prevailed in a very competitive offer situation beating out 21 other offers and to be able to move in before the holidays! Previous: No Holiday Slowdown in the SF Market!